Ask any Swede and they will tell you that this is their country’s most popular cake. It's easy to make and every café has its own version. What makes it special is that it’s deliberately under-baked and has no raising agents, keeping the middle gooey. The word ‘kladd’ means ‘sticky’ in Swedish, and it really is very sticky indeed. 1. Preheat the oven to 180˚C, gas mark 4. Grease and line a loose-bottomed 20cm cake tin. Melt the butter and leave to cool slightly; set aside. Whisk the eggs, sugar and vanilla together using electric beaters until light, fluffy and pale. Make sure you whisk for a good 3-4 minutes. 2. Sift the flour and cocoa powder into the egg and sugar mix, then fold in carefully until everything is incorporated. Next, fold in the melted butter until you have a smooth, thick chocolate mixture. 3. Pour into the lined tin and bake for about 20 minutes. The exact time can vary, so keep an eye on the cake. 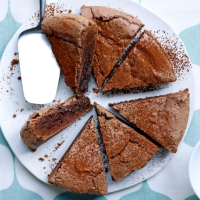 A perfect kladdkaka is very soft in the middle, but not too runny once cooled. It won’t rise but will puff up slightly during baking. If you press down gently on the cake while it is baking, the crust should need a tiny bit of pressure to crack. This signals that the cake is done. Leave to cool in the tin (unless you fear it has possibly had a minute too long, in which case remove immediately). Serve with vanilla ice cream or vanilla-spiked whipped cream, if liked.